We're often are asked how long a person should wait between applying the various products in their daily skincare routine. Given the variety of products you can use to make a significant difference in the appearance of your skin, it's a logical question! We have a simple answer you're sure to love: You don't have to wait! If you're using gentle, well-formulated skincare products (and you should be), then in most circumstances, waiting is more about personal preference than necessity. Can Skin Handle So Many Products All At Once? The reason you don’t have to wait is that everything you apply is going to easily absorb and do its job of taking great care of your skin. No product is going to get in the way of another product’s ability to permeate into skin or interfere with its efficacy. Skin can easily handle many beneficial ingredients all at once. In fact, because each ingredient has a unique benefit, it would be a mistake not to give your skin all it requires to look smoother, hydrated, younger, more even toned, clearer, and less red, among many other skincare concerns. Ultimately, it’s more about the product feel and your preference than being about how many products you are using or how the products absorb or set. Some people just like the feel of waiting between skincare steps, while others prefer layering one product right after the other. You can even choose to mix the various products you use in the palm of their hand before applying. All of those options are just fine, with the major takeaway being you don’t have to wait. Your skincare routine can be quickly applied! Many people are worried about whether they can apply their other skincare products immediately after applying their AHA or BHA exfoliant but you can relax: A well-formulated exfoliant will work perfectly well regardless of what you apply over it or how soon you apply it. The concern some people have is that the other products they apply will change the AHA or BHA’s pH, thus diluting and altering its efficacy. To describe this a bit more technically, the pH of a product doesn’t shift that fast, especially when the other skincare products you are applying also have an acidic pH (which the products you use should be, as skin’s pH is naturally acidic) or a pH of 7, which is neutral. If you notice that a combination of products you're using tends to roll or ball up when you apply one right after the other, then it's probably best to allow the first product to dry before applying the next product in your routine. Because sunscreen always needs to be the last skincare product you apply, it's a good idea to allow a few minutes for it to set before you apply your makeup. If your foundation or tinted moisturizer contains sunscreen and is rated SPF 30 or greater, then there's no need to wait. (And we love when you layer sunscreens with a moisturizer and foundation that both have SPF 30 or greater ratings to assure you’re applying sunscreen liberally). When you have blemishes and use a benzoyl peroxide based product as a treatment to get the problem under control it is best to wait until it absorbs before applying serums and/or moisturizers. Benzoyl peroxide works better when it has had time to absorb by itself. This only takes a few seconds so it isn’t a huge time drain. 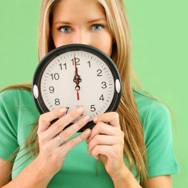 Not having to wait between applying skincare products will definitely be easier and save you time. It will also allow you to experiment with adding one of our boosters and serums to your skincare routine. These helpful additions won’t add much time and will definitely benefit your skin. To learn more about what each product in our line does and how they can be used together, check out our article How to Put Together A Skincare Routine.